Alonso Hernández del Portillo was born in Gibraltar probably in 1543. He was employed by the local council as Jurado de consejo covering the area then known as La Barcina and Villa Vieja. Among other responsibilities he had to make sure that the council was supplied with food and other necessities. Portillo is best known as the author of Historia de la Muy Noble y Muy Leal Ciudad de Gibraltar much used as a primary source by many other later historians of Gibraltar - especially as regards descriptions of the town and of some of its traditions . His book is generally credited with being the first general history of Gibraltar ever written. It is hard to trace the date when he started writing his history and even harder to determine when he completed it. According to the modern Spanish historian, Antonio Torremocha Silva he wrote most of it from 1605 to 1610 and then reviewed it using marginal notes and a few textual changes from 1615 to 1624. One small problem with this last theory is that the book mentions an event which the author dates as having occurred in 1625. Map of Gibraltar at the time Portillo was writing - despite the date! Curiously Portillo does not make any mention of Rosia - either as a chapel or a bay - in his history. From a reading of Portillo's prologue it would also seem that he never expected his history to be published. It was - and more than once . The original was carefully safeguarded for many years by the Cabildo or City Council in Gibraltar and then later in San Roque after the British 1704. This was the copy used extensively by Ignacio Lopez de Ayala ( see LINK ) in the late 18th century when he wrote his own Historia de Gibraltar. In the mid 19th century the original went missing and has so far never been found. Since then and for a number of years, many historians have been dependent on whatever sections of the work Ayala bothered to use. Shortly afterwards a member of the Perez de Guzman family - with long family connections with Gibraltar that are much mentioned by Potillo himself - discovered a manuscript of the work held in the Biblioteca Nacional de España. It is dated 1781 and could be a handwritten copy by Ayala. My own notes are taken from this handwritten text. It means that I have had to take several small liberties while transcribing it. Where a particular word proved indecipherable or hard to understand I have used a question mark (?) to identify the word. I have also updated some of the old Spanish spelling to make the thing - hopefully - more readable. 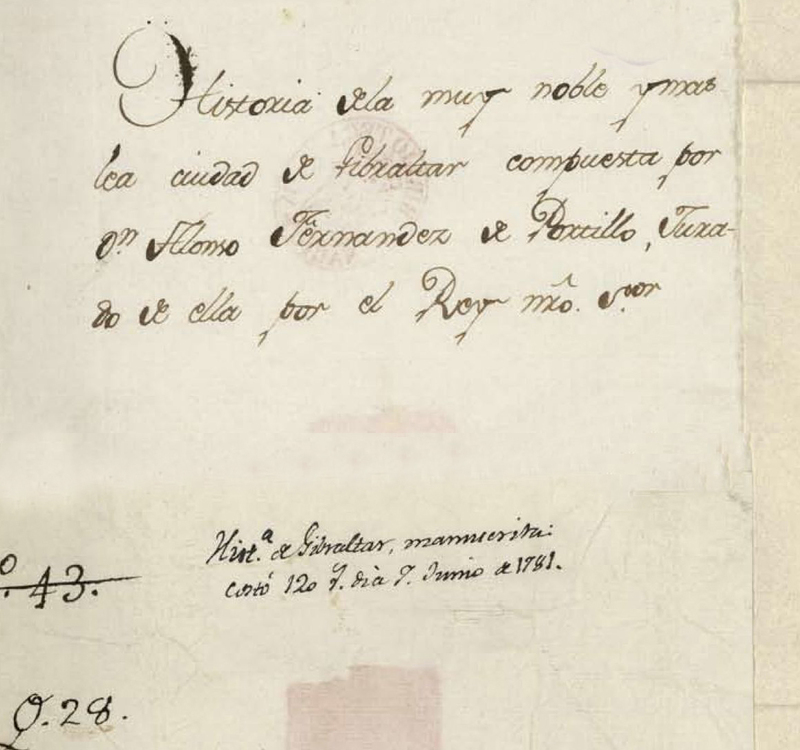 The front page of Portillo's Historia de Gibraltar, possibly in Ignacio López de Ayala's handwriting. It would also be useful to take into account that the Rock Portillo lived in was - despite the expulsion of the Moors - still a frontier town. It was heavily fortified and was an important Spanish naval base. It was also continually under threat from Corsairs operating from the Barbary coast which required an almost constant state of alert. Ordinary citizens were armed, and the town was divided into defensive zones one of which was headed by Portillo himself. It is also easy to forget that Portillo's Gibraltar did not end at the start of the isthmus. In his day it included the entire area now occupied by La Linea, Los Barrios, San Roque and right across the Bay to Algeciras and beyond. As Portillo continually reminds us, the ruins of Carteia were definitely part of the picture. Portillo's History consists of a Prologo and seven Libros. Please click on the appropriate link to read the corresponding section. Libro Primero - La Descripción del Monte y Ciudad. Libro Segundo - Se Prosigue la Descripción de Nuestra Ciudad y Monte. Libro Cuarto - Historia hasta que Gibraltar se Ganó a los Moros la Última Vez.